We seek warm, bright, energetic, child-centered individuals for our staff of over 100 summer camp counselors and support staff. In anticipation of an important professional relationship, we interview each candidate, looking for significant personal resources and accomplishments, talents in camp areas, self-awareness, solid judgment, and a capacity to participate productively in a child-centered environment. References and background checks are a required part of this process. Our 2-week staff training addresses relationship building, group life, conflict resolution and more. Counselors then develop teaching programs and a rich understanding of their cabin groups in anticipation of camper arrival. Peter and Meg provide ongoing staff supervision and guidance. All counselors are trained in risk management and Hidden Valley’s staff also includes five Registered Nurses. Apply to be part of our summer staff! Approximately 15% of our staff hails from countries such as Holland, Britain, and New Zealand; the rest join us from throughout the U.S. Some former campers return to support the next generation of campers. 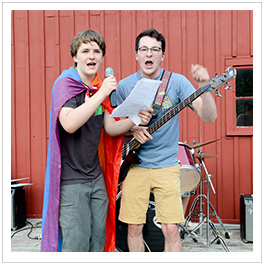 Many others are students, working artists and outdoors-people who find that Hidden Valley's progressive values and philosophy match their own. Find out more about International Staff life here. 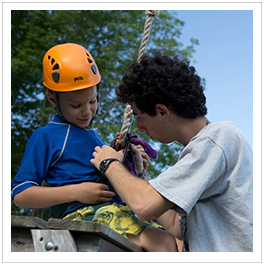 I loved working in such a caring, educational, lively environment for both staff and campers. This summer has been fun and deliciously paradoxical. I've been brought back to my own childhood and yet this summer's experiences make me feel older, wiser... better equipped for life. Your compassion and patience with your employees and campers is something I remember every day when I'm teaching. Our daughter chose Hidden Valley from the several camps she saw in videos. But videos cannot guarantee that there will be a caring person who takes time to notice that a child who is generally sunny may need some attention from time to time... I cannot tell you how comforting it was for us to know that you were there for her when she most needed a friend... Counselors like yourself make all the difference in a child's life and I want to thank you from the bottom of my heart.